Now, I don't particularly care what made it into the budget and what didn't. Actually, I do care, but that's not what motivates me to rant. California's in a tough spot, and tough decisions needed to be made, and it's guaranteed that there's something in the budget for everyone not to like. Let's just stipulate all of that. What annoys me, however, is how Democrats stood firm -- firm! -- on one tiny issue. They even had to accept an issue that they hated, but they still held rock firm to prevent one idea (from the Republican whose vote passed the budget) from making it in to the final legislation. This issue wouldn't have cost the taxpayers a dime (it probably would have saved them a bit a money, even). It wasn't ideological or right-wing or any of that. The issue? A new law that would have cut off the pay for the state congress if the budget wasn't delivered on time. Once the deadline rolled around, if there was no budget signed, there would be no more paychecks for legislators. Period. They wouldn't get paid again (and would forfeit pay in the meantime) until the budget was finished. I don't know about you, but that sounds like a pretty good idea to me. I wrote about state senator Abel Maldonado earlier this week, and outlined the three things he was demanding in exchange for his vote on the budget. The Democrats gave him two of these (and even tossed out a 12-cent-per-gallon gas tax hike to boot). Democrats agreed to put on the ballot two propositions -- one that would deny legislators raises when California was in deficit, and one that would open our primary system up. I am suspicious about that last one, because it won't be on the ballot until 2010, which seems designed to be able to tinker with it later, in the hopes nobody will notice. The open primary is loathed by both major parties, I should point out. It's not just the Democrats. But Maldonado was able to convince them to accept this, while the Democrats obviously went to the wall over making sure they were paid -- even when they fail to do their jobs. Now, this is not just a California problem. Our budget is late pretty much every single year. It's almost a tradition. To give you but one example, our budget just passed. It was due June 15 of last year. That means it is eight months late. But before tut-tutting about this, consider that our federal budget for last year isn't done yet, either. It was due on October first, meaning it is less delinquent, but still not completed. I personally supported Abel Maldonado in his effort to bring some consequences to these elected officials when they do not perform one of the basic duties of their jobs. And I think it's pathetic that the Democrats chose this one issue to rally behind defeating. But that's enough local news for this week. Let's move on to the awards, and then get into the heavy, heavy irony of calling a rant from Wall Street "populism," shall we? Some minorly impressive stuff happened this week, including Hillary Clinton's first trip abroad, and Barack Obama's signing his stimulus package as well as his own first official foreign trip (to Canada, eh?). But while good news, none of it rose to the level of a Most Impressive Democrat Of The Week award. The stimulus bill was impressive, but the signing ceremony was an afterthought, and most of that fight happened the previous week. And foreign trips are nice, but no stunning news (good or bad) came out of either Clinton's trip or Obama's. David Axelrod also had a good showing on last week's Sunday morning shows, but this didn't rise to the award-worthy level either. This week the MIDOTW award goes to Illinois Governor Pat Quinn for publicly calling for Roland Burris to step down from the Senate seat he was named to by former (impeached and removed) Governor Rod Blagojevich. This may sound like an easy political position to take, given the outcry over Burris' faulty memory, but the willingness to take a stance on the issue rather than letting front groups do it for you is striking, at least to me. We've heard plenty of cries from editorial pages and concerned citizens calling for Burris to step down, but what other politician has stepped up and done so? Anyway, some may disagree, but I'm awarding this week's Most Impressive Democrat Of The Week to Illinois Governor Pat Quinn this week. Of course, there's a flip side to this as well. Roland Burris' shifting explanation of exactly what happened before he was appointed to the Senate by Blagojevich isn't exactly what I would call impressive. Disappointing seems to fit a lot better. Burris' methods of browbeating the Senate Democrats into accepting him without a fight (which, at the time, I referred to as: "...not just 'playing the race card.' This is a new level of such political cardsharpery, and should be referred to as 'throwing the entire race deck in the air, in a game of 52-Race-Card-Pickup.' ") got him into the Senate, with only one prerequisite -- that he tell the truth before the Illinois impeachment hearings. Now it appears he is trying to "revise and extend" his testimony, conveniently after the fact of getting seated in Barack Obama's vacant Senate seat. Which is disappointing, to say the least. But Burris himself is going to have to share this award with the Democrats in the Illinois legislature. Because they have the power to end this once and for all. All they need to do is call for a special election in a month or two. Hold a special election for Burris' seat. If he wins the election, he gets to keep the seat. If he does not, then it won't matter much if he resigns or not, because he will be replaced in a short span of time. This, I should note, is the second MDDOTW award for the Illinois legislature Democrats, since this is the second chance they've had at resolving this mess (see FTP ). So, to Roland Burris and the Illinois Democrats, a plea: you need to stop prolonging this nightmare. Step up to the plate. You are this week's Most Disappointing Democrat Of The Week, but you can change all of that if you just try. I mean, seriously, can nobody see how laughable things are, at times? I speak, of course, of the media frenzy over Rick Santelli, and his rant on CNBC the other day. NBC led with the story on its flagship Nightly News with Brian Williams cheerfully promoting his own network as "news." In case you haven't seen the clip, Santelli appears to be standing on the floor of the New York Stock Exchange, while he channels his inner populist. He rails against President Obama's mortgage bailout plan, and how some people will have their tax dollars to pay for those losers who are getting foreclosed upon. At one point, he turns to the traders in the background for support, and asks them if they're willing to bail out these losers. Not surprisingly, he gets no takers. When I saw this clip, my initial reaction was has the entire freaking country lost its mind?!? Obama is proposing using $75 billion to try and stop the utter collapse of the housing market. Now, according to people who know, Wall Street has already received, and will need in the near future, something like at least ten to twenty times this amount of the same "taxpayers' money" to bail them out. And when I say "Wall Street" I am talking about those people wandering around behind Santelli. Once again, to put things in perspective, the people Santelli was calling to the class warfare barricades make over ten times the pay of an average American worker. This is populism? You have got to be kidding me. Somebody needs to buy a dictionary for the media. Hey, I'd even chip in for that one. Because populism is actually exactly the opposite of Santelli's rant. It is a political movement against Wall Street bankers. Let me just repeat that, for the slow learners in the media: not led by Wall Street, but against Wall Street. White House Press Secretary Robert Gibbs didn't take it lying down, at least. He shot back with his own take on Santelli this morning, and I can't improve on his quote one bit. "I'm not entirely sure where Mr. Santelli lives or in what house he lives. But the American people are struggling every day to meet their mortgage, stay in their jobs, pay their bills to send their kids to school, and to hope that they don't get sick or somebody they care for gets sick that sends them into bankruptcy. I think we left a few months ago the adage that if it was good for a derivatives trader, that it was good for main street. I think the verdict is in on that." OK, I can't let it go. This concept needs to be strongly attacked, whenever the word comes up. "Populist? Populism? Excuse me? Did you really just use the word 'populism' to describe Santelli? Does this news department even own a dictionary, or a history book? Do you even know what that term means? I think you need to go look up the term 'populism' and how it relates to Wall Street traders, and then you can come back and apologize for your ignorance. For the love of the English language, please don't try to call Santelli and the traders he was addressing as 'populism' in any way, shape, or form." I have to turn over the next four items to a brief interlude on last week's Meet The Press, hosted by David Gregory on NBC. Because some people finally got it right when talking about Obama's stimulus plan achievement. Gregory was even swept up in the swell of correct perspective himself (albeit briefly... I've had to cut all his other remarks, which consist solely of -- you can't make this stuff up -- "Mm-hmm," "Hm," and one more "Mm-hmm."). "In my opinion, you have to say that Obama is a winner this week because he got through an, a, a huge, complicated, almost $800 billion spending rescue bill in record time. I mean, this doesn't happen in Washington. And, and you know, sure, the beginning of an administration is the time when you really want to spend some political capital and, and, and, and those chips, but wow. I mean, this is, this is the biggest spending bill of this kind ever passed..."
At this point, Gregory sees the light, and interrupts with his own little dose of sanity, breaking away from the "conventional wisdom" in Washington to provide some much-needed context. Of course, these weren't original ideas, but quotes he was repeating... but still, at least he picked the right quotes for once. "And it's interesting. Frank Rich in, in the Times this morning talks about the fact that, yeah, in Washington and in the echo chamber a lot of people were writing him off, and yet he maintained his popularity around the country. Even though there was lagging support for the stimulus at points, when Obama was attached to it, it was still popular. John Harwood also writes this in his piece in the Times: 'The bright spot for Mr. Obama is that the communications and social networking strengths he and his team demonstrated during the campaign may fit the task of preserving presidential initiative.' ... 'Leaders with projects and an electoral mandate keep people with them by mobilizing, educating, and persuading,' [Pollster Stan] Greenberg said. 'It has actually been a long time since we've had a president with that kind of momentum that has carried through to pass major elements of the reform agenda.' With enactment of the stimulus package, 'Obama will now have done this' in less than a month, Mr. Greenberg added. 'Now he has to keep support for much tougher measures.' "
"Yeah, I think it's really kind of silly to compare the victory of the week and the bumps of the week. I mean, as Gene said, the magnitude of the -- this bill was a presidency in a box. He achieved more of his aims in this single legislation than many presidents will achieve in an entire term. I mean, there is more new net public investment here on things the Democrats consider essential for long-term growth -- like education, scientific research, alternative energy -- than Bill Clinton was able to achieve in two terms. And there are -- I mean, there are other aspects of this, as well. If you go back to 1993 -- first of all, Bill Clinton didn't pass his economic plan till August, Ronald Reagan until the end of July. When Clinton's plan passed, 41 House Democrats voted against it, and six Senate Democrats. So the other side of the Republican unity against this was the incredible Democratic unity for it. Only seven House Democrats, no Senate Democrats voting against it. What we're seeing here I think in party by -- in this House -- the difficulty you talk about in winning Republicans is a fundamental long-term change in our political system. Both parties are more unified than they were a generation ago. And I think in some ways this is a wake-up call for Obama that there is a limited number of Republicans who have electoral or ideological incentives to work for him, and he may have to try to build a broader definition of what it means to have an inclusive and bipartisan presidency." Roger Simon from Politico gets the final word, pointing out some reality to the Republican Party. "People didn't really vote for bipartisanship. They voted for an end to gridlock brought upon by hyperpartisanship. I don't think it was such a bad thing for President Obama to reach out his hands to the Republicans and have those hands slapped away. Here's a party shattered after two congressional elections in a row, whose only unifying principle is that they're against Obama. In the end, that's not a winning hand for the Republicans. With just Democratic votes and a very few Republicans, President Obama is being seen to get things done. Now, if those things succeed, and that's a big if, that's a huge victory for him and a huge defeat for the Republicans who turned their backs on him." Finally, some sad news, although not altogether unexpected. Forgive me for sticking it in here, but the news just broke, and there was nowhere else to put it. 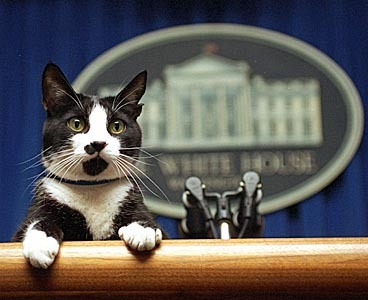 Socks Clinton, former First Cat. That was good for the soul. Your FTP columns need to be syndictated in newspapers across the country and you may single-handedly, so to speak, save them from the dustbin of history, where so many are destined to rest without the kind of life-saving intervention that you can uniquely provide. I mean that sincerely - absolutely, positively, unequivocally! This one was like a veritable rollercoaster ride, from start to finish, beginning with a strong and building rise to the first height, replete with anticipation for what lies around the next curve. There were moments of sheer laugh out loud hilarity contrasted with roll of the eyes to the back of the head absurdity, brilliantly culminating in the screaming prospects of a "media-ocracy"! And, then on to the soft landing of a media reprieve leading to redemption, if only fleeting, upon reaching the final crest before a heart-stopping, breathtaking semi-free fall to sadness and loving remembrance. There is a reason why the Democrats of Ill (Get it?? "Democrats of Ill"?? :D I crack myself up.. :D) don't want a special election. To answer your question, "if mainstream media ran the country..." we'd call it a "failed State." And, Senate seats are Constitutionally defined. Why does everyone want to pretend the ILL legislature (you got that right Michale)can just pass laws to retroactively change Senatorial selections? It would be in court longer than Burris will be in office. And Illinois would lose. Again. And I'm shocked, SHOCKED, that Burris may have lied. We refuse to call anyone corrupt unless they are CURRENTLY under indictment. And we're ALWAYS amazed that having faced no consequences in the past, corrupt politicians are repeat offenders. I'm sorry, but when it comes to political "ethics" we've cheerfully raised stupidity to an art form.